“The coalition broke apart over the civil rights issues,” said Eunice Rho, a lawyer for the American Civil Liberties Union. The organization, which initially supported the measures, now opposes them unless they include language ensuring that they will not be used to permit discrimination or harm. In the 1990s, for example, in the kind of case that raised red flags for civil rights advocates, landlords cited religious beliefs, sometimes with success in court, after refusing to rent to unmarried heterosexual couples. 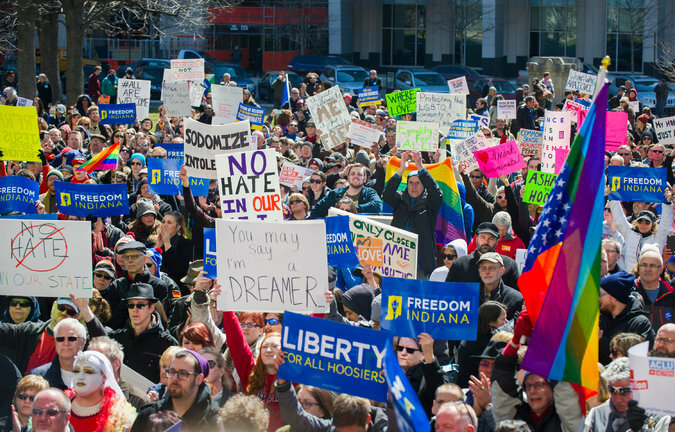 The clash of values erupted again after Indiana adopted its own version of a “religious freedom” act last week. Arkansas is expected to approve a similar law this week. The over reaction by the republican leaders made me realize that there is a group of Christians that are too involved in our government. They are using their wealth to buy our leaders. This group should be Taxed because they are not acting like a religion or a church. The whole point of my quotation above was to demonstrate that the teachings of Jesus rejected what these so-called Christians believe is acceptable moral behavior. Jesus did not persecute thieves, whores and tax collectors. He loved and forgave them. People are defined not by what they say but what they do. Those who do these things in his name are not true Christians. Jesus would have none of this. I understood what you were quoting but I lost my train of thought. You still doing brain surgery as one of your professions? LOL. I could use the help currently.